Most of you know that my 84 year old Grandma Gloria loves to bake. She’s inspired several recipes on the blog including these buttermilk waffles, sunflower honey oatmeal bread, Peruvian chicken, healthy bran muffins and this fabulous butternut squash green chili chicken stew. A few weeks I was in New Mexico visiting my mom and grandma and noticed about 30 oranges sitting on her counter (no joke!). 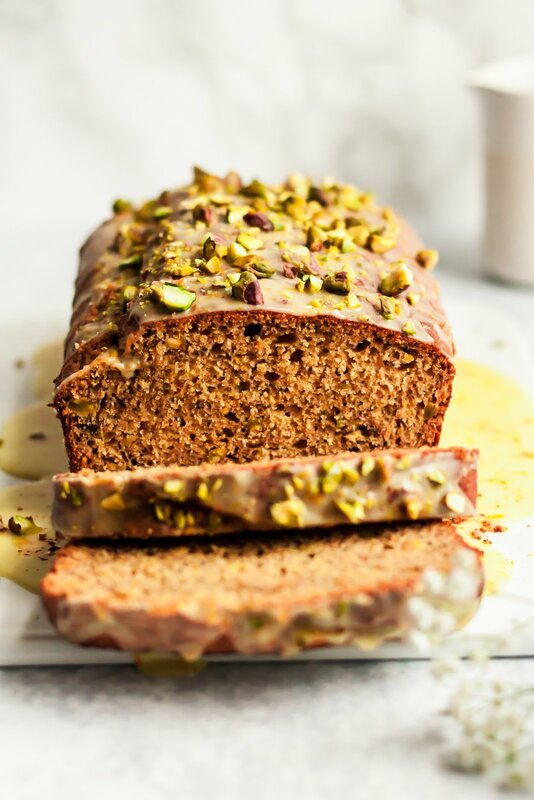 Most of you know I’m obsessed with all things orange so I decided to bake some healthy orange muffins and then eventually went home and tweaked the recipe into this healthy orange bread made with protein-packed yogurt, naturally sweetened with honey and full of crunchy poppyseeds and pistachios. GUYS, this could be my favorite bread EVER! Whole wheat pastry flour: I love using whole wheat pastry flour in baking because it’s a little more nutritious then regular flour. This is the brand I use. Baking powder & baking soda: You need to use both in this recipe to make it nice and fluffy! Butter (or coconut oil): I prefer to use butter in this recipe to for both flavor and texture, but melted coconut oil would also work well. Yogurt: the most amazing part of this bread the texture thanks to the yogurt. I highly recommend using whole milk plain greek yogurt because it adds an addition level of moisture to the bread. It’s delicious! Honey: I love using honey in baking; it’s a great all natural unrefined sweetener. 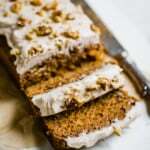 Eggs: two eggs are used in this recipe for a cake like texture. I haven’t tried flax eggs but I think it might work. Please let me know if you try it! Vanilla & almond extract: use both for a hint of unique flavor! Fresh orange juice and zest: Make sure you use freshly squeezed orange juice and zest for amazing orange flavor! Poppyseeds: there’s just something to love about the flavor poppyseeds bring to breads and muffins. 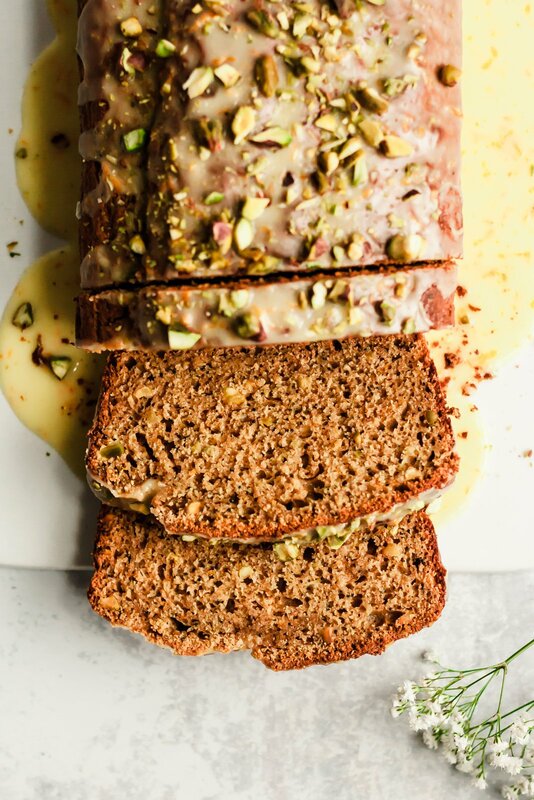 Pistachios: I wanted to do something different so I decided to use pistachios in this bread. Please know that you can sub them out for toasted walnuts or pecans, or you can omit them completely. The orange glaze on this bread is so ridiculously good that I want to put it on everything. It’s full of sweet, fresh orange flavor and incredibly easy to make. It’s butter free too; all you need is powdered sugar, fresh orange juice and orange zest! YUM. I love topping the bread with a few extra crushed roasted pistachios on top for added crunch. Instead of yogurt, feel free to use a dairy free coconut, soy or almond yogurt. Make sure to use coconut oil instead of butter too! If you want to make this bread gluten free, I suggest this 1:1 gluten free baking flour or you could try and sub chickpea flour, but the flavor may slightly change. 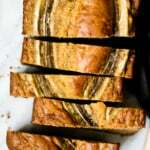 If you make these orange bread, be sure to leave a comment and rate the recipe below! I’d love to hear from you and it helps encourage others to make the recipe too! 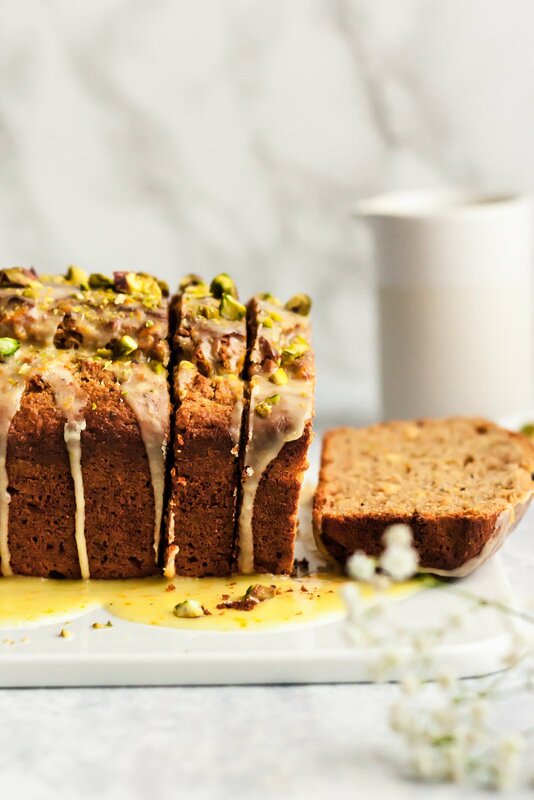 Gorgeous pistachio poppyseed orange yogurt bread naturally sweetened with honey and fresh orange juice, and topped with a perfectly sweet orange glaze. 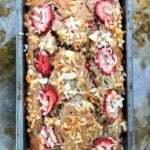 A delicious, healthy yogurt bread for spring! Preheat oven to 350 degrees F. Line a 8x4 inch pan with parchment paper and spray with nonstick cooking spray. In a large bowl, whisk together the melted butter, honey and orange zest until smooth. Next, whisk in orange juice and greek yogurt. Finally, whisk in the two eggs, vanilla and almond extracts. In a separate bowl, whisk together the whole wheat pastry flour, baking powder, baking soda and poppyseeds. Add dry ingredients to wet ingredients and mix with a wooden spoon or until just combined. Gently fold in chopped pistachios. Pour batter into prepared pan and spread out evenly. Bake for 35-50 minutes until tester comes out clean. Cool completely on a wire rack before glazing. For the glaze: Mix together powdered sugar, orange juice and orange zest until smooth. You may need to add in more orange juice to thin out the glaze, but remember we want it to be a thicker glaze but still pourable. Pour or drizzle over the top of the loaf and spread towards the sides. Garnish with chopped pistachios. To make into muffins: Divide batter between 12 greased muffin liners. Bake for 18-24 minutes or until tester comes out clean. 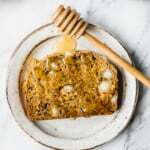 If you want the bread to be just slightly sweeter, I suggest using ½ cup honey instead of ⅓ cup, this is especially necessary if you aren’t using the glaze. *Instead of whole wheat pastry flour, you can use 1 cup whole wheat flour and 1 cup all purpose flour. To make dairy free: use a dairy free yogurt such as soy, coconut or almond instead. 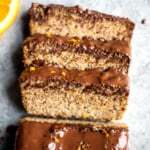 *If you are looking for a gluten free recipe, I would suggest my paleo orange loaf. 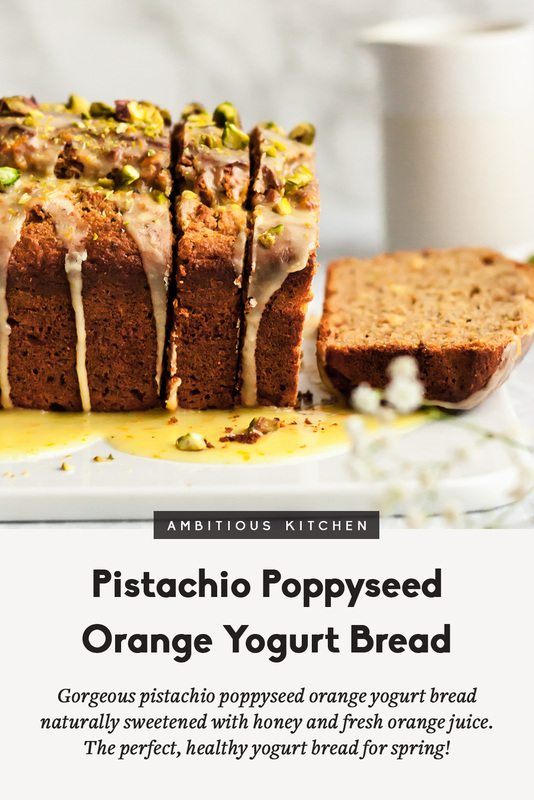 42 Responses to "Pistachio Poppyseed Orange Yogurt Bread"
Im obsessed with pistachio!!! and the combo of them with orange, YES! totally giving this a go and will try making it GF and report back! Whoo hoo — can’t wait to hear how it turns out! This is just gorgeous, friend! Can you sub something for the poppyseeds? You can simply leave them out! This bread is SO delicious! Just the right amount of sweetness and perfect for spring! Loved the flavors but mine came out super dry. Any suggestions? So sorry you had that issue. I just baked this again and it was perfectly moist! 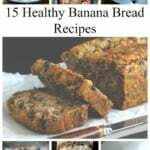 A few questions: did you make any changes to the recipe? Or perhaps you baked it too long? Every oven is different. Let me know! No changes. I kept testing it and the toothpick wasn’t coming out clean. So I kept baking for 5 minute increments. Maybe I’ll just take it out after the 45 minutes and see how it is. Looks delicious! I’ve been on a blood orange kick – do you think an equal substitution of blood orange juice would work? You can use 1 cup whole wheat flour and 1 cup all purpose flour! I just made this and it turned out great! I used coconut oil and blood oranges as I bought them by mistake. Mine was done at 43 minutes. Thanks for the great recipe! Amazing! Blood oranges sound delicious in here. Glad you enjoyed! 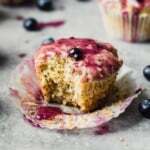 Made this recipe into muffins this past weekend and they did not disappoint! Not only were they beautiful to look at but they were equally delicious! I opted for the dairy-free recipe (used coconut oil and almond milk yogurt) and they came out amazing! Just made this, and the flavors are heavenly!! The bread turned out just right after 40 mins of baking. Next time, I’ll tweak the glaze to make it less sweet and more orange-y. Thanks for this brilliant recipe! I made this bread and it is wonderful. I used Mandarins as that is what I had & it turned out delish. I cooked exactly 45 minutes & next time it could even come out a couple minutes earlier. Thanks for the recipe! Hi Stephanie! I would do all purpose flour and also reduce the liquid in the recipe by a tablespoon or two. I made this as a muffin recipe (minus the pistachios) and it turned out great! The muffins were DELICIOUS. So moist and fluffy! 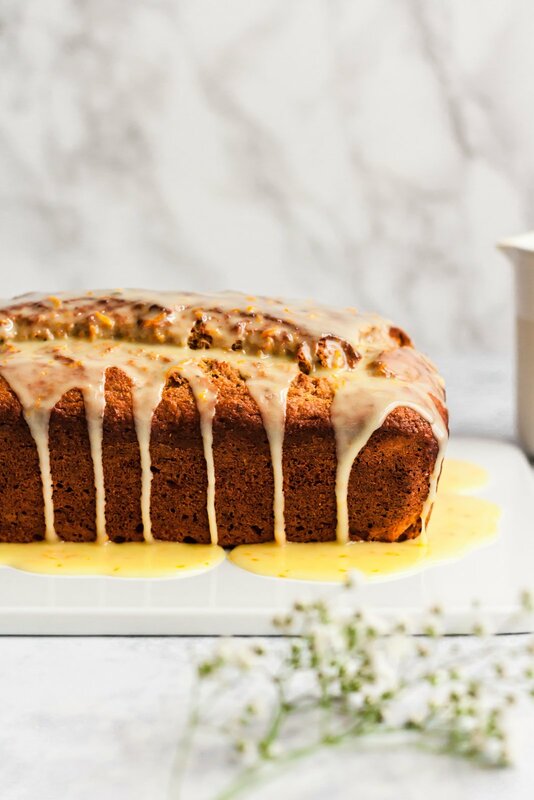 The glaze makes sets this recipe apart. I will definitely be making these again! How can you make this sugar free? I’m allergic to all natural and processed sugar. Unfortunately I’m not sure how to completely eliminate all the sugar without it compromising texture + taste (especially with all of the fresh orange juice in here). 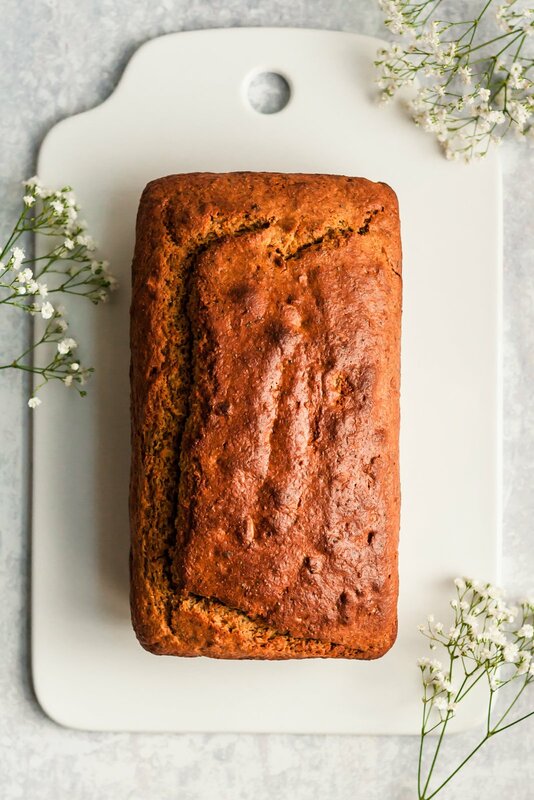 This bread is a baker’s dream come true, especially in the spring! Was a little dry, but I think that’s because I used fall eggs instead of chicken eggs. Otherwise, LOVE the orange flavor, not too much, not too little. Will be making again! Glad you loved this one! Perfect for spring 🙂 I’m not sure where the dryness could be coming from, but maybe it’s the different eggs that you used. Hi Monique, is it possible to sub with plain flour or cake flour as whole wheat pastry flour is expensive and not easily available where I live. I also wonder if I could sub with plain yogurt instead of greek yogurt. I’d love to give this a try. 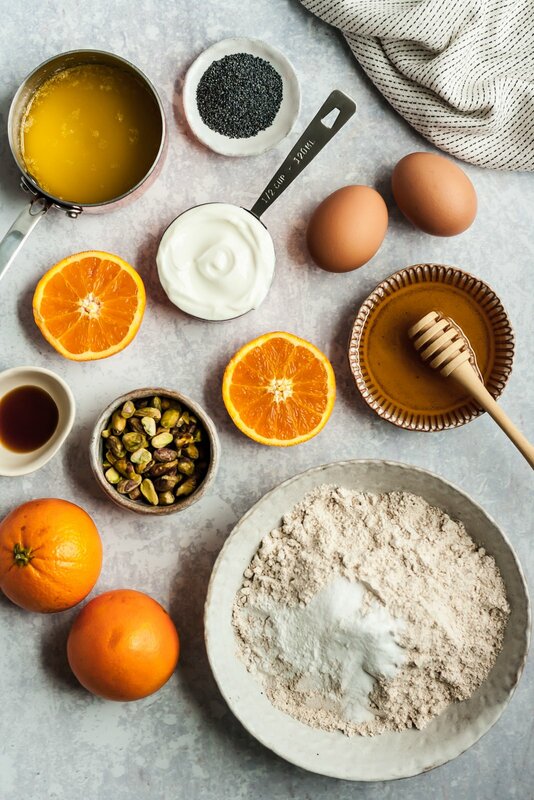 Orange and pistachio …. sounds delish! Hi Christina! Yes you can use all purpose flour and plain yogurt. You might want to slightly reduce the liquid in the recipe by 2 tablespoons. Made the muffin version and AMAZING! New favorite baked good to bring for brunches, thanks for an amazing recipe! Would love to know the best way to store this bread! In the refrigerator or can you just keep in in a covered container?